Can anything good come out of Ikorodu? The answer is YES! Recently, Lagosians were reportedly warned to stay away from Ikorodu town while natives conduct the Eluku festival. A warning went viral on social media that no one, especially visitors, should be seen within Ikorodu between August 26 and 29, especially between 10pm and 5:30am to avoid falling prey of traditional sacrifice that highlights the festival. The false report also claimed that the sacrifice would be preformed using misguided humans. 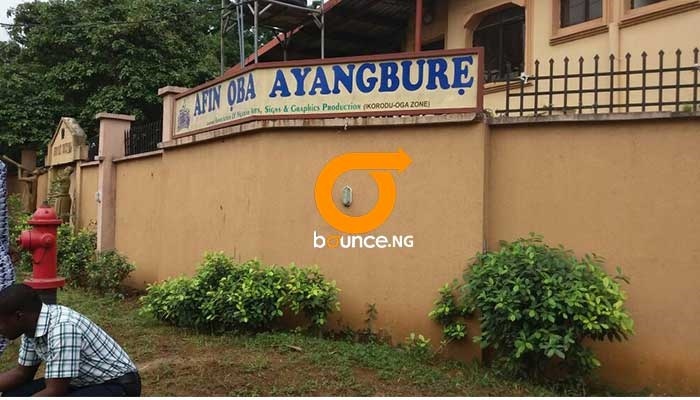 Bounce News visited the the Ayangburen of Ikorodu, Oba Kabir Adewale Shotobi who promptly dissociated himself and the palace from the circulating alarm, saying the report was totally misleading. He added that the Eyibi/Eluku festival has a specific location and will not in anyway hinder movement within Ikorodu and its suburbs. In a visit to the palace on Monday, Bounce News was not allowed to officially speak to the Oba or any of his kinsmen. From the roundabout to the entrance of the Oba's palace, it was business as usual without anyone being forced to close their stalls or abandon their shops. Our correspondent spoke to some residents of Ikorodu, who said the Eluku Festival was done without noise or intimidation. “They did it on Saturday, an Okada rider said. “On that day, I closed before 6pm. You need to see how this area was. The area was crowded in the evening because people were rushing home, everyone trying to avoid being caught up in the wrong place. “And then some streets were closed and no one was allowed to move around there as a result of the festival. Another resident told Bounce News that the event was done peacefully and not as bad as it was described. “I was already indoor before 7pm on Saturday, and I didn’t see anything unusual. We all slept and woke up on Sunday quietly, and since then, nothing. I think it was majorly done on Saturday. Even some of my friends said except for the restriction of movement in some areas, the festival was done quietly." The Eyibi/Eluku festival is one of four major festivals in Ikorodu town. The first festival in the year is the Odun Osu which gives the traditional green light for other festivals to follow. It, invariably takes place towards the end of the dry season and before the start of the first rains. Odun Osu is a royal festival in which the highest traditional social club. "The Rogunyo" plays a very important role. After Odun Osu comes Magbo festival which has been described as the ‘greatest carnival’ in the town. Magbo festival is a ‘Male-only’ affair. Both festivals are celebrated with the women folk staying in-doors for 24 hours. None of these festivals hold on Fridays or Sundays as a mark of respect for Muslim and Christian holy days. After the Magbo is the "Eyibi" festival which incorporates the special outing by the Eluku. Eluku’s role in their traditional society is reflective of an executioner just as the Osugbo was to the traditional judiciary. He implements the law and calls out those found guilty of breaking regulations or ignoring customs. Another important festival is the Ogun festival. This is celebrated during the late rains of September to October. It is the last traditional festival of the year and it is meant to appease the god of iron. A petty trader said she has witnessed the festival several times. "I have never been present at the Eluku Festival, but I have been in Ikorodu for a long time. All you need to do is get home early and stay indoors, nobody will knock on your door to arrest you. It is those that goes about indiscriminately that are caught up with the event."